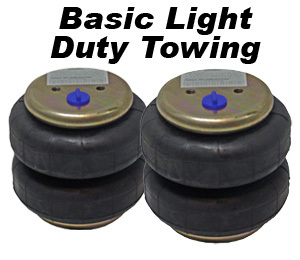 To better understand how they work, please "Click"
This is a Basic Tow kit that is offered all over the USA by our Competitors, because it is a one size fits all, and is not suited for most customers. It is a small 6.00" #2500 bag that takes far too much psi to lift, resulting in a very rough ride. You should MAKE ROOM for the largest diameter bag possible, and this means you should install the $299 INBOARD kit that bolts onto the axle. You may have to relocate exhaust or shock absorbers on some vehicles, but it will be worth it. 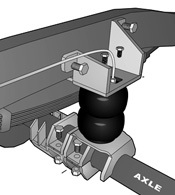 Most customers think that if they put airsprings on their truck, it will ride smoother. THIS IS NOT TRUE. It will ride rougher because the Air Spring exerts pressure on the leafsprings and increases the tension. 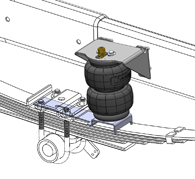 When you install any Air Spring, you should REMOVE the overload springs and even a leaf or two to soften up the ride. Our larger bags are 7.25" in Diameter and have 2" more travel. This kit uses either a 7.25" DeNominator-II bag which is 2" taller than Competitors #2600 bag or even up to a #3800 8.50" bag, depending on available room. 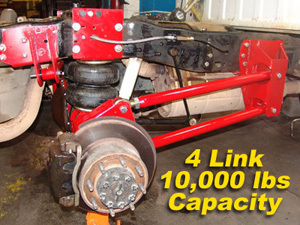 It mounts INSIDE the frame and over the axle. Sometimes you have to move the exhaust and/or the shock mount to make room for the bag, Now it takes only 30psi to lift instead of 120psi, and rides smooth. Be SURE to remove overloads and even an extra leaf or two. Select the vehicle below you would like more information on. This is an amazing kit, takes only 25psi to reach ride height, 100% Bolt-on Makes your HD truck ride like a passenger car. "Kneels" to accept your 5th wheel, 10,000lbs towing capacity. Complete FBSS Plug & Play, plugs into 2 Dual Gauges, and 3-Gal tank. 1/2HP Compressor with Check Valve, Pressure Switch, Relays, Circuit Breaker, and Steel Leader Hose Pre-Installed just as you see it. Nothing to Wire or Plumb. Save about 2 days on your install time. Optional cover available as an Upgrade.